In a fragmented albeit competitive global IV bags market, keen players are expending money on product innovation to gain competitive advantage. These players are also considering strategic partnerships and alliances that will consolidate the vendor landscape to some extent. The increasing adoption of injection-based therapeutic practices and rising prevalence of chronic diseases is primarily driving the global IV bags market. IV bags are considered to be ideal for the administration of drugs and vital nutrients to patients who are unable to ingest anything orally. Apart from this, the rising aging population globally that is susceptible to health conditions is also a key factor stoking growth of IV bags market. On the downside, the risk of leaching of chemicals from plastic IV bags is inhibiting the growth of IV bags market to some extent. As per estimates of a report by Transparency Market Research (TMR), the global IV bags market is likely to secure a valuation of US$1,363.8 mn in 2017. Expanding at a rate of 5.4% between 2017 and 2027, the market is likely to peg a valuation of US$2,316.5 mn by 2027 end. The global IV bags market is studied on the basis of material type, capacity type, chamber type, and region in this report. On the basis of material type, the global IV bags market has been segmented into PE, PP, PVC, and others (EVA and copolyester ether). Amongst all, PP segment is anticipated to dominate over the forecast period due to its chemically inert and non-reactive nature with the packaged solution. On the other hand, the PVC segment is anticipated to lose its market share due to the risk of release of toxins in the packaged solution. In terms of capacity, the segments into which the global IV bags market is divided are 0-250 ml, 250-500 ml, 500-1000 ml, and above 1000 ml. Vis-à-vis volume, the segment of 0-250 ml is anticipated to continue its dominance over the forecast period. Depending upon chamber type, the global IV bags market is segmented into single chamber and multi chamber IV bags. Of the two, single chamber IV bags are expected to hold the leading share in the IV bags market. However, multi chamber IV bags segment is anticipated to surpass in terms of growth rate. The growth of multi chamber IV bags segment is attributed to the ease of delivering two or more fluids at the same time. The worldwide IV bags market has been divided geographically into: North America, Europe, Asia Pacific, Latin America, and the Middle East and Africa. North America leads the overall market in terms of revenue, and is anticipated to represent a year-on-year growth of US$300.6 mn over the forecast period. Powered by the U.S., the North America IV bags market is anticipated to rise at a CAGR of 5.0% between 2017 and 2027. However, it is Asia Pacific that is anticipated to register the leading CAGR of 6.1% over the 2017-2027 forecast period. 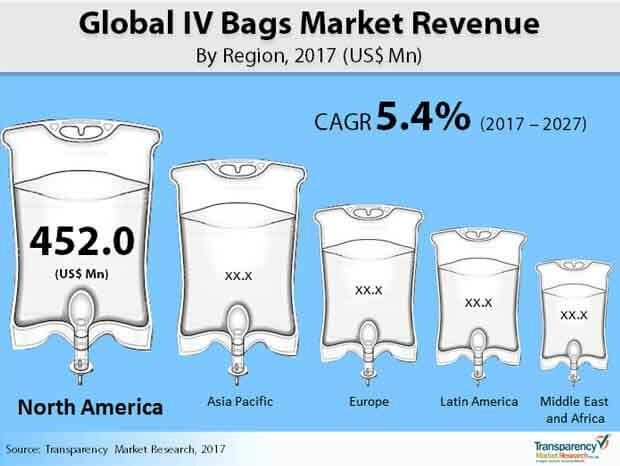 Europe is also a significant market for IV bags; the region is likely to display 5.3% CAGR between 2017 and 2027 to contribute a revenue of US$510.7 mn by 2027 end. Key participants in the global IV bags market profiled in this report include B.Braun Melsungen AG, Baxter international Inc., Hospira Inc., West Pharmaceutical Services Inc., Wipak Group, Technoflex S.A., Fresenius SE & Co. KGaA, Sippex, Polycine GmbH, Kraton Corporation, The Metrix Company, Medicopack A/S, Macopharma SA, Haemotronic S.p.A, Renolit Solmed, Otsuka Pharmaceutical India Private Limited, Alfa Laboratories, and Qosina Corporation. The Staggering rise in the prevalence of chronic diseases is expected to push the growth of the global IV bags Market. The market is also driven by rising adoption of injection based therapeutic practices. For administering vital nutrients or drugs to patients who are not in the condition to ingest medicines or vital nutrients orally, IV bags turn out to be the perfect solution. It is anticipated that the global IV bags will rise from US$1,363.8 mn in 2017 to US$2,316.5 mn by 2027, expanding at a 5.4% CAGR from 2017 to 2027. One of the key factors, which is working in the favor of the global IV bags Market is the increasing geriatric population. As this population base is highly susceptible to various diseases and health conditions, they will create a demand for IV bags. Old aged people usually find it difficult due to their various health conditions, to administer vital nutrients orally as well as administer drugs orally. Therefore, for the efficient administration of drugs and nutrients IV bags are required. IV drugs are increasingly being preferred as compared to oral drugs because they generate quicker results and are highly accurate. IV bags are extremely crucial for parenteral nutrition as they are extensively preferred for the administration of amino acids and other compounds. Some of the most popularly used IV bags are PVC, PE, and PP. Of these, the BP material IV bags are expected to lead in the years to come as this material is nonreactive in nature and chemically inert. The IV bags made from PVC are expected to witness a decline in the demand as it holds the risk of releasing toxins in the packaged solution. IV bags come in single chamber and multi-chamber types. Single chamber IV bags is currently leading in the market but the multi-chamber IV bags is estimated to expand at a higher pace on account of the ability to deliver two fluids simultaneously. On the basis of geography, the global IV bags narket is segmented into Europe, Asia Pacific, North America, the Middle East and Africa, and Latin America. In terms of revenue, it is North America which is leading in the market and is expected to exhibit a year on year growth of US$300.6 mn during the forecast period from 2017 to 2027. The North America IV bags market will expand at a 5% CAGR from 2017 to 2027 contributed primarily by the U.S. Europe is also expected to be one of the key markets for IV bags and exhibit a 5.3% CAGR between 2017 and 2027. It is estimated that the European IV bags Market will be worth US$510.7 mn by 2027. However, all the other regions will be left behind by Asia Pacific in terms of growth rate, because Asia Pacific is anticipated to register a CAGR of 6.1% during the forecast period. The global IV bags market is extremely fragmented. However, players are also considering strategic mergers and acquisitions, collaborations, and partnerships which may consolidate competitive landscape of the global IV bags market to a certain extent. The competition also runs high in the market as leading players within the market are trying hard to develop innovative products for gaining competitive advantage. The leading players in the global IV bags market are: Otsuka Pharmaceutical India Private Limited, Macopharma SA, Baxter international Inc., Polycine GmbH, B.Braun Melsungen AG, Hospira Inc., Wipak Group, West Pharmaceutical Services Inc., Technoflex S.A., Sippex, Fresenius SE & Co. KGaA, Alfa Laboratories, Kraton Corporation, The Metrix Company, Haemotronic S.p.A, Medicopack A/S, Renolit Solmed, and Qosina Corporation.